Having too much caffeine can make you feel nervous or jittery. The effects of caffeine can last up to 6 hours. If you think you’re having too much caffeine, you may want to cut back gradually. Caffeine is naturally found in the leaves, beans, seeds, and fruits of many plants. It’s also added to some foods and drinks and some pain relievers. Caffeine works by exciting your nervous system which may make you feel more awake and alert. Having too much caffeine may make some individuals feel nervous, restless or jittery. Too much caffeine can also make it challenging to fall asleep as the effects can be felt for up to 6 hours. Common sources of caffeine include coffee, tea, caffeinated soda, energy drinks, chocolate, some over the counter medicines, and some prescription medications. Caffeine is also found in some dietary supplements, diet pills, energy shots, pre-workout supplements, and caffeine pills. Not necessarily. Most energy drinks have high levels of caffeine in addition to other added vitamins, minerals, and/or chemicals that could have an impact on the effect of the caffeine as well as your overall health. It’s recommended by medical professionals that kids under the age of 12 not consume any caffeine and teens limit or avoid caffeine, in part because the amount of caffeine that’s safe for teens to have in a day has not been determined. For adults, a limit of 400 milligrams of caffeine per day (which roughly equals 4 cups of coffee, 2 cans of soda, or 2 “energy shot” drinks, however this can vary widely) is considered safe. Given that we do not yet know the amount of caffeine that is safe for teens, for adolescents drinking more than 400 mg (about the amount in 4 cups of coffee) it is important to cut back on caffeine consumption. The effect caffeine has on a person depends on how sensitive that person is to it. Sensitivity is affected by body weight and the amount of caffeine a person typically has. Some teens who are more sensitive to caffeine will feel stronger effects with smaller amounts than others who may be less sensitive to it. Having too much caffeine can cause side effects like “the jitters,” restlessness, anxiety, insomnia (trouble sleeping), headaches, high blood pressure and a fast heart rate. Caffeine is a diuretic, which means that it will make you have to urinate (pee) more often. It can be dehydrating if you are in the heat or working out, so for individuals sensitive to caffeine, it may be best to avoid it before vigorous exercise. Another impact of caffeine that is particularly important for adolescents is its relationship to bone health. 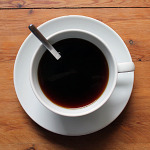 It has been reported that individuals who consume a high amount of caffeine may have bones with less density, ultimately leading to weaker bones. This happens because caffeinated beverages may interfere with your body’s ability to absorb calcium. Caffeine can also cause certain medical conditions, such as heart problems, to become worse. Although it is uncommon, extremely high intake of caffeine from energy drinks has been linked to some deaths in teenagers. If you take in caffeine in combination with some medications used for ADHD, asthma, and certain heart conditions, the side effects (such as feeling like you have the jitters) can be more noticeable and uncomfortable. It’s important that you ask your health care provider if you should avoid caffeine. In addition, caffeine can be especially harmful when mixed with alcohol. This is because the caffeine can give a person who has been drinking a false sense of alertness. This may make the typical effects of alcohol consumption feel different, which can be confusing for the brain. It is very important not to mix alcohol and caffeinated beverages. If you think you’re having too much caffeine and would like to stop, you may wish to try and cut back slowly. Stopping too fast can lead to headaches, fatigue or lack of energy, and irritability or crankiness for a few days. Although caffeine may give you an energy boost, it’s important to think about the positive and negative effects of caffeine. Be sure to talk to your health care provider to make sure it’s safe for you to have caffeine-containing drinks, foods, and medications.